Consider this random experiment. You ask people (one at a time) of their birthdays (month and day only). The process continues until there is a repeat in the series of birthdays, in other words, until two people you’ve surveyed share the same birthday. How many people you have to ask before finding a repeat? What is the probability that you will have to ask people before finding a repeat? What is the median number of people you have to ask? In this post, we discuss this random variable and how this random variable relates to the birthday problem. In the problem at hand, we ignore leap year and assume that each of the 365 days in the year is equally likely to be the birthday for a randomly chosen person. The birthday problem is typically the following question. How many people do we need to choose in order to have a 50% or better chance of having a common birthday among the selected individuals? The random experiment stated at the beginning can be restated as follows. Suppose that balls are randomly thrown (one at a time) into cells (e.g. boxes). The random process continues until a ball is thrown into a cell that already has one ball (i.e. until a repeat occurs). Let be the number of balls that are required to obtain a repeat. Some of the problems we discuss include the mean (the average number of balls that are to be thrown to get a repeat) and the probability function. We will also show how this random variable is linked to the birthday problem when . First, we start with the birthday problem. The key is to derive the probability that in a group of randomly selected people, there are at least two who share the same birthday. It is easier to do the complement – the probability of having different birthdays among the group of people. We call this probability . where . The reasoning for the first line is that there are 365 choices to be picked in the first selection. Each subsequent random selection has to avoid the previous birthday, thus 364 choices for the second person and only choices for the th person. In a random group of 23 people, there is a less than 50% chance of having distinct birthdays, and thus a more than 50% chance of having at least one identical birthday. This may be a surprising result. Without the benefit of formula (1), some people may think that it will take a larger sample to obtain a repeat. The benefit of (1) extends beyond the birthday problem. Let’s consider the case for , i.e. randomly pick numbers from the set with replacement until a number is chosen twice (until a repeat occurs). Similarly, let be the probability that in draws all chosen numbers are distinct. The probability is obtained by replacing 365 with . Formula (2) will be useful in the next section. We now look into the random variable discussed at the beginning, either the one for picking people at random until a repeated birthday or throwing balls into cells until one cell has two balls. To illustrate the idea, let’s look at an example. Roll a fair die until obtaining a repeated face value. Let be the number of rolls to obtain the repeated value. Find the probability function where . Note that is the probability that it will take rolls to get a repeated die value. To get a repeat in 2 rolls, there are 6 choices for the first roll and the second has only one choice – the value of the first roll. To get a repeat in 3 rolls, there are 6 choices for the first roll, 5 choices for the second roll and the third roll must be out of the 2 previous two distinct values. The idea is that the first rolls are distinct and the last roll must be one of the previous values. The reasoning process leads nicely to the general case. In the general case, let’s consider the occupancy interpretation. In throwing balls into cells, let be defined as above, i.e. the number of balls that are required to obtain a repeat. The following gives the probability . The reasoning is similar to Example 1. To get a repeat in throwing balls, the first balls must be go into different cells while the last ball would go into one of the occupied cells. For the first balls to go into different cells, there are ways. There are cells for the last ball to land. Thus the product of these two quantities is in the numerator of (3). Once the probability function (3) is obtained, the mean can be derived accordingly. For the case of , (calculated by programming the probability function in Excel). On average it will be required to sample about 25 people to obtain a repeated birthday. Another interesting quantity is . This is the probability that it will take throwing more than balls to get a repeat. Mathematically this can be obtained by first calculating by summing the individual probabilities via (3). This is a workable approach using software. There is another way that is more informative. For the event to happen, the first throws must be in different cells (no repeat). The event is identical to the event that there is no repeat in the first throws of balls. This is how the random variable is linked to the birthday problem since the probability should agree with the probability in (2). Consider the case for . What is the median of ? That would be the median number of people surveyed to obtain a pair of identical birthday. The median of would be the least such that is at least 0.5. Note that is identical to in (1). The above calculation shows that and . Thus the median of is 23. Thus when performing the random sampling of surveying birthday, about half of the times you can expect to survey 23 or fewer than 23 people. The birthday problem is equivalently about finding the median of the random variable . A little more broadly, the birthday problem is connected to the percentiles of the variable . In contrast, the mean of is . The following lists several percentiles for the random variable . It is clear that in a group of 366 people, it is certain that there will be at least one repeated birthday (again ignoring leap year). This is due to the pigeon hole principle. As the percentiles in the above table shows, you do not need to survey anywhere close to 366 to get a repeat. The median is 23 as discussed. The 75th percentile of is 32. The preceding calculation shows that you do not need a large group to have a repeated birthday. About 50% of the times, you will survey 23 or fewer people, about 75% of the time, 32 or fewer people, About 99% of the time, you will survey 57 or fewer people, much fewer than 365 or 366. So with around 50 in a random group, there is a near certainty of finding a shared birthday. In a random group of 100 people, there should be an almost absolute certainty that there is a shared birthday. For a further demonstration, we simulated the random variable 10,000 times. The range of the simulated values is 2 to 78. Thus the odds for 100 people to survey is smaller than 1 in 10,000. To get a simulated value of 100, we will have to simulate more than 10,000 values of . The median of the 10,000 simulated results is 23. The following table summarizes the results. Not shown in the table is that 33 of the simulated results are the value of 2. Thus it is possible to ask two people and they both have the same birthday. But the odds of that happening is 33 out of 10,000 according to this particular set of simulations (probability 0.0033). The theoretical probability of 2 is 1/365 = 0.002739726. There are 2 instances of 78 in the 10,000 simulated values. Thus the odds are 2 out of 10,000 with probability 0.0002. The theoretical probability is 0.000037 using (3). How long does it take to collect all coupons? This post discusses the coupon collector problem, a classical problem in probability. The problem is usually stated as a coupon collector trying to collect the entire set of coupons. For example, each time the coupon collector buys a product (e.g. a box of breakfast cereal), he receives a coupon, which is a prize that can be a toy or a baseball card or other interesting item. Suppose that there are different types of coupons (prizes) and that the coupon collector wishes to collect the entire set. How many units of the product does the coupon collector have to buy in order to collect the entire set? A simplified discussion of the coupon collector problem is found in another blog post. This post is more detailed discussion. This blog post in another blog discusses the coupon collector problem from a simulation perspective. As shown below, if there are 5 different coupons, it takes 12 purchases on average to get all coupons. If there are 10 different types of coupons, on average it would take 30 purchases. If there are 50 different types of coupons, it would take on average 225 purchases collect the entire set. The first few coupons are obtained fairly quickly. As more and more coupons are accumulated, it is harder to get the remaining coupons. For example, for the 50-coupon case, after the 49 coupons are obtained, it takes on average 50 purchases to get the last coupon. Suppose that the coupon collector does not want to collect the entire set and only wishes to collect distinct coupons where . It turns out that this special case only requires a minor tweak to the case of collecting the entire set. Our strategy then is to focus on the main case. The special case will be discussed at the end of the post. We first consider the main case that the coupon collector wishes to collect the entire set. The problem can be cast as a random sampling from the population . Selecting a number at random from with replacement is equivalent to the coupon collector receiving a coupon. Let be the minimum number of selections such that each number in is picked at least once. In this post we discuss the probability function of as well as its mean and variance. Another interpretation of the problem is that it can be viewed as an occupancy problem, which involves throwing balls into cells at random. The random quantity of interest is the number of balls that are required to be thrown such that each cell has at least one ball. Clearly this formulation is identical to the coupon interpretation and the random sampling interpretation. The angle of occupancy problem is useful since we can leverage the formulas developed in this previous post. A description of the occupancy problem is given here. Regardless of the interpretation, the goal is obtain information on the random variable , the minimum number of random selections from in order to have the complete set of distinct values represented in the sample. where is the additional selections from to get a number that is distinct from the distinct numbers that have been chosen. For example, is the number of random selections to get a number that is distinct from the two distinct numbers obtained up to that point. Note that each involves repeated sampling until some criterion is reached, thus resembling a geometric random variable. Indeed they are. As the sampling continues and as more distinct values are obtained, it is not as easy to obtain a new number. After distinct numbers have been obtained, the probability of drawing a new distinct number is . As geometric random variables, each has the following mean and variance. where . Note that the random variables are independent. The value of does not depend on how many trials it takes to draw the previous distinct numbers. The following gives the mean and variance of . The expectation can be rearranged as follows to give more information. The quantity is the partial sum of the harmonic series. Note that as . Thus as . The quantity can be interpreted as the average number of units of product that are required to purchase per coupon. The following table lists out the expected values for selected values of . Table 1 gives an estimate on how long to expect to collect the entire set of coupons for selected coupon sizes. The third column gives the expected total number of purchases to obtain the entire coupon set. The second column gives an estimate of how many purchases on average to obtain one coupon. For the 50-coupon case, it takes on average about 4.5 purchases to obtain one coupon. However, it does not tell the whole story. To get the 50th coupon, it takes on average 50 trials. Note that in the 50-coupon case in formula (1). In a simulation of the 50-coupon problem, it took 54 trials to obtain the 50th coupon. To get the 49th coupon, it takes on average 50/2 = 25 trials. We now view the coupon collector problem as an occupancy problem in order to leverage a formula from a previous post. Suppose that we randomly throw balls into cells. Let be the number of empty cells as a result of randomly assigning balls into cells. The following gives the probabilities where . The notation is the binomial coefficient, which is the number of ways to choose objects out of objects where order does not matter. The calculation is defined by . The formula (5) gives the probability of having empty cells. In throwing balls into cells, the probability of having occupied cells is then . Rather than memorizing the probability function in (7), a better way is to focus on the thought process that is inherent in (6). One comment about the calculation for (7). The summation for has terms. A given probability may involve multiple values of , e.g. Unless the number of values for is very small, the calculation should be done using software. Microsoft Excel is an excellent way to perform the calculation. The calculations for the examples below are programmed in Excel. Suppose that a fair die is rolled until all 6 faces have appeared. Find the mean number of rolls and the variance of the number of rolls. What is the probability that it will take at least 12 rolls? What is the probability that it will take more than 15 rolls? The following is the probability function for . Even though the average number of trials is 15, there is still a significant probability that it will take more than 15 trials. This is because the variance is quite large. An Internet startup is rapidly hiring new employees. What is the expected number of new employees until all birth months are represented? Assume that the 12 birth months are equally likely. What is the probability that the company will have to hire more than 25 employees? If the company currently has more than 25 employees with less than 12 birth months, what is the probability that it will have to hire more than 35 employees to have all 12 birth months represented in the company? The random variable of interest is . The following shows the mean and probability function. Performing the calculation in Excel, we obtain the following probabilities. We now consider the special case that the coupon collector only wishes to collect distinct coupons where . Of course, is the total number of distinct coupon types. Let be the minimum number of purchases such that distinct coupons have been obtained. In the random sampling interpretation, would be the minimum sample size such that distinct elements have been chosen from the sample space . The mean and variance of follow from the same idea. Each is the independent sum of geometric random variables as in (0). Thus and would be like (1) and (2) except that the summation is through instead of . For the probability function of , we only need to tweak the thought process expressed in (6) slightly. For the event to happen, exactly cells are occupied after throwing balls with the first balls landing in cells. In other words, there are exactly empty cells after throwing balls and there are exactly empty cells after throwing balls. The following expresses this condition in terms of the occupancy problem, i.e. similar to (6). Here’s the important components that need to go into with the first one coming from the occupancy formula (5). Multiply the above two probabilities together produces the desired probability for . Note that when (collecting the entire set of coupons), formula (10) would be identical to (7). The following example demonstrates the calculation. Consider the 6-coupon case discussed in Example 1. Suppose that the coupon collector is interested in collecting coupons. What is the expected number of purchases to get 4 coupons? What is the probability that it will take more than 6 purchases to get 4 coupons? What is the probability that it will take more than 8 purchases to get 4 coupons? Compare these results with Example 1. Note that it is much faster to obtain 4 coupons than the entire set of six. The following gives the probability function for . Performing the calculations in Excel gives the following probabilities. The first probability shows there is still a good chance that it will take more then the mean number of trials to get 4 coupons. The wait time is much less than in Example 1 since the probability of wait time more than 8 is fairly small. One distributional quantity that is easy to obtain is the moment generating function (MGF) for the random variable (the case of collecting the entire set of coupons) as well as for the random variable (the partial case). Since both of these random variables are the independent sum of geometric random variables, their MGFs would simply be the product of the individual geometric MGFs. The following gives the results. There are two celebrated problems in probability that originated from the French professional gambler Chevalier de Méré (1607-1684). The problems were solved jointly by Blaise Pascal (1623-1662) and Pierre de Fermat (1601-1665) in a series of letters. The ideas discussed in these letters were often credited with having started probability theory. In a previous post, we discuss one of the problems posed by Chevalier de Méré to Pascal (the dice problem). In this post, we discuss the second problem – the problem of points. Here’s a description of the famous problem of points. Two players play a game of chance with the agreement that each player puts up equal stakes and that the first player who wins a certain number of rounds (or points) will collect the entire stakes. Suppose that the game is interrupted before either player has won. How do the players divide the stakes fairly? It is clear that the player who is closer to winning should get a larger share of the stakes. Since the player who had won more points is closer to winning, the player with more points should receive a larger share of the stakes. How do we quantify the differential? To describe the problem in a little more details, suppose that two players, A and B, play a series of points in a game such that player A wins each point with probability and that player B wins each point with probability . The first player to win points wins the game. Suppose that the game is stopped for some reason. At the time of stopping, player A has won points and player B has won points with and . How do they divide the stakes? Note that the pot is contributed equally by the two players. In attacking the problem, Pascal’s idea is that the share of the stakes that is received by a player should be proportional to his/her probability of winning if the game were to continue at the point of stopping. Let’s explore this idea by looking at examples. The following examples are based on the following rule. Let’s say two players (A and B) play a series of points with equal probability of winning a point at each round. Each player puts up a stake of 32. The first player who wins four points take the entire stakes. Suppose that player A has won 2 points and player B has won one point right before the termination of the game. How can the stakes be divided fairly? In the analysis, we assume that the game continues. Then player A needs 2 more points to win while player B needs 3 more points to win. We would like to calculate the probability that player A wins 2 points before player B winning 3 points. Consider the next 2 + 3 – 1 = 4 rounds (assuming one point per round). If player A wins at least 2 points in the next 4 rounds, player A win the game. The complement of this probability would be the probability that player B wins the game. Let S (success) be the event that player A wins a point and let F (failure) be the event that player A loses a point (i.e. player B winning the point). Let’s write out all the outcomes of playing 4 points (this was the approach of Fermat). There are 16 such outcomes. Player A wins In eleven of the outcomes (the ones with asterisk). Note that there are at least 2 S’s in the outcomes with asterisk. Thus the probability of player A winning is 11/16 = 0.6875. At the time of stopping the game, player A has a 68.75% chance of winning (if the game were to continue). The share for player A is 0.6875 x 64 = 44. The example demonstrates the approach taken by Fermat. He essentially converted the original problem of points into an equivalent problem, i.e. finding the probability of player A winning the game if the game were to continue. Then he used combinatorial methods to count the number of cases that result in player A winning. In this example, the additional four points that are to be played are fictitious moves (the moves don’t have to be made) but are useful for finding the solution. The only draw back in Fermat’s approach is that he used counting. What if the number of points involved is large? The specifics of the example are the same as in Example 1. The listing out all possible cases in Example 1 makes the solution easy to see. But if the number of points is large, then the counting could become difficult to manage. What we need is an algorithm that is easy to use and is easy to implement on a computer. Note that the above probability of 0.6875 is the probability of having at least 2 successes in 4 trials (with 0.5 probability of success in each trial). Anyone with a good understanding of the binomial distribution can carry out the calculation (or use software). Of course, this mathematical construct came from Pascal! To the contemporaries of Pascal and Fermat, this concept was definitely not commonplace. Suppose that player A has won 1 point and player B has won no point at the time of termination of the game. How can the prize money be divided fairly? Based on the discussion of Example 1 and Example 2, player A needs to win at least 3 points to win the game and player B needs to win 4 or more points to win the game. The extended series of points would have 3 + 4 – 1 = 6 points. Player A then needs to win at least 3 points out of 6 points (at least 3 successes out of 6 trials). The following gives the probability of player A winning the extended series of plays. With the total stakes being 64, the share for player A would be 64 x 42/64 = 42. The share for player B would be 22. We now discuss the ideas that are brought up in the examples. As indicated above, two players, A and B, contribute equally to the stakes and then play a series of points until one of them wins points. The probability that player A wins a round (one point in each round) is and the probability that player B wins a point is . Suppose that the game is stopped for some reason before either player has won. At the time of stopping, player A has won points and player B has won points with and . Let and . The key to solving the problem of points is to look at an extended play of points. Here’s the great insight that came from Pascal and Fermat. They looked forward and not backward. They did not base the solution on the number of points that are already won. Instead, they focused on an extended series of points to determine the share of the winning. This additional play of points is “fictitious” but it helps clarify the process. In essence, they turned the original problem of points into a problem about this additional play of points. where , and that is the number of points won by player A and is the number of points won by player B at the time the game is terminated. The probability is the probability of player A winning the game if the game were to continue at the point of termination. This probability is the proportion of the stakes that would be awarded to player A. Of course, the proportion that should be awarded to player B would be . The quantity can be obtained from the given parameters and by using any software that has a function for the binomial distribution. The problem of points seems to have an easy solution since the answer is so accessible. Any one who understands the binomial distribution can comprehend. It is also easy to compute probabilities for a binomial distribution using calculator or software. One thing to keep in mind is that the solution looks accessible now because of the tools and concepts that came from trails blazed by Pascal and Fermat (and because of the computing tools that we have). Tools and concepts such as Pascal’s triangle and binomial distribution were unknown to people at the time of Pascal and Fermat. For us, the calculation in is easily done using calculator or software. Pascal did not calculate directly and instead perform the calculation backward by using the following formula. The formula can be derived mathematically. But doing that is not necessary. The quantity is the probability that player A will win points before player B winning points. We can derive the above formula by conditioning on the outcome of the first point. The quantity is calculated in Example 1 and Example 2. It is the average of two similar probabilities with smaller parameters. Based on the recursive formula in , Pascal built up the answer backward, similar to the way a computer program is written. In fact, this recursive approach allows us to solve not just for one scenario, but for all the scenarios in a game of points. We now revisit the problem in Examples 1 and 2. Recall that the game is to play for 4 points, i.e. the first player winning 4 points collects the entire stakes of 64 (32 is contributed by each player). Each player earns a point with probability 0.5. We now show how to divide the stakes when the game is stopped at every possible stopping point. The following diagram (Figure 1) shows the table for the share awarded to player A. The table is empty except for the top row and rightmost column (the numbers in red). The number 64 shown in the last column would be the amount awarded to player A because player A has won 4 points. The number 0 in the top means that player B has won 4 games. So player A gets nothing. Note that the bottom row highlighted in orange shows the numbers of points that have been won player A. The bottom row highlighted in blue shows the remaining points that player A needs to win in order to win the entire stakes (these are the fictitious points). Similarly, the columns highlighted in orange and blue on the left show the same information for player B. Now, we can use the recursive formula in to fill the table. Basically each cell is the average of the number above it and the number to the right. The parameter in is a number in the blue row. The parameter in is a number in the blue column. The following shows the results. For example, when player A has won 2 points and player B has won 1 point, the share for player A is 44 (the average of 32 and 56), the same answer as in Example 1 and Example 2. When player A has won 2 points and player B as won 2 points, both players are in equally competitive positions. Then each player gets 32. When player A has won 2 points and player B as won 3 points, the share for player A is 16 (the average of 0 and 32). Essentially the formula in is the idea of using smaller steps rather than the entire extended play of points. This idea of smaller steps was preferred by Pascal. At the point where player A needs more points to win and player B needs more points to win, the idea is to play one more point. Suppose that the players know the awards to the two players after one more round. Then they should split the difference between the future awards. The calculation should begin at the point where each player only needs one more point to win (the cell with 32 in Figure 2). In that cell, we know the awards after one additional round. Taking the average of 0 and 64 gives 32. From that cell, we move down and move left on the table. Keep repeating the process until the entire table is filled in. There is a way to tweak the table approach to work for unequal winning probability of a point. Let’s say the probability of player A winning a point is 0.6. Then the probability of player B winning a point is 0.4. The value of a given cell in the table would be the weighted average of the cell on the right (0.6 weight) with the cell above it (0.4 weight). When we know the results from playing one more round, we assign 0.6 to the result of player A winning and 0.4 to the result of player B winning. The following table shows the results. The direct formula or the table approach using the recursive formula can be easily programmed in a computer. For Pascal, the table approach is a very attractive option since the calculation can be built up from lower parameter values. In the above configuration, simply fill in the right column (the entire stakes going to player A) and the top row (player A getting nothing). Then the remaining cells are obtained by weighted average as described in formula . We present one more example. Suppose that player B is a casino and player A is a visitor at the casino playing for 12 points. The house edge is 2% so that the probability of player A winning a round is 0.48. If player A desires to leave after player A has won 9 points and the house has won 6 points, what is the proportion of the stakes that should be awarded to player A? Playing for 12 points, player A needs 3 more points to win and the house needs 6 more points to win. So we need to analyze an extended play of 3 + 6 – 1 = 8 points. For player A to win the extended play, he needs to win at least 3 points. Based on the fair division method discussed in this blog post, player A deserves 82.76% of the stakes. In their correspondence, Pascal and Fermat came up with convincing and consistent solution to the problem of points. The earlier solutions to the problem of points were not satisfactory (to all concerned) and are sometimes inconsistent. Division of stakes only basing on the numbers points that have been won may produce extreme results. For example, if player A has won 1 point and player B has won no points, then player A would get the entire stakes. For the game described in Figure 2, for the same scenario, player A gets 42 out of 64 (42 / 64 = 0.65625), which is far from 100%. For more detailed information on the history of the problem of points, see “A History of Mathematics” by Victor J. Katz. When a gambler consistently loses large sum of money, what can he or she do? When one particular gambler, Chevalier de Méré (1607-1684), was losing a big fortune, he called a “mathematical help line”. In fact, his correspondence with Blaise Pascal (1623-1662) earned him a place in the history book. The problems that were presented by de Méré, jointly worked on by Pascal and Pierre de Fermat (1601-1665), are regarded as the beginning of the emerging academic field of probability. Chevalier de Méré was in need of help for two problems – the problem of points and on the dice problem that now bears his name. In this post we discuss the dice problem. The problem of points is discussed in the next post. There were two dice problems from Chevalier de Méré. The first game involves four rolls of a fair die. In this game, de Méré made bet with even odds on rolling at least one six when a fair die is rolled four times. His reasoning was that since getting a six in one roll of a die is (correct), the chance of getting a six in four rolls of a die would be (incorrect). With the favorable odds of 67% of winning, he reasoned that betting with even odds would be a profitable proposition. Though his calculation was incorrect, he made considerable amount of money over many years playing this game. The second game involves twenty four rolls of a pair of fair dice. The success in the first game emboldened de Méré to make even bet on rolling one or more double sixes in twenty four rolls of a pair of dice. His reasoning was that the chance for getting a double six in one roll of a pair of dice is (correct). Then the chance of getting a double six in twenty four rolls of a pair of dice would be (incorrect). He again reasoned that betting with even odds would be profitable too. But experience showed otherwise. As he lost a lot of money, he realized something was not quite right with the second game. In 1654, he challenged his renowned friend Blaise Pascal to find an explanation. The solution emerged in a series of letters between Pascal and Fermat. Out of this joint effort, a foundation was laid for the idea of probability as an academic subject. One particular idea that emerged was the Pascal triangle. Another one was the binomial distribution. In fact, anyone who understand the binomial distribution can very quickly see the faulty reasoning of de Méré. Before we get to the calculation, let’s simulate the games played by de Méré. Using random numbers generated from using the Rand() function in Excel, we simulated 100,000 iterations of each of the games. In our 100,000 simulations of the first game – rolling a die four times, there are 51,380 iterations with at least one six. This suggests that de Méré’s position would win more than half of the time, though not the odds that he believed. But it was profitable for him nonetheless. In our 100,000 simulations of the second game – rolling a pair of dice 24 times, there are only 49,211 iterations with at least one double six. This seems to support that de Méré’s position is a losing proposition, that he would be losing his bets more than half the time. Of course, de Méré could have done similar simulation, though in a much smaller scale, by rolling the dice himself (say, 100 times). He could have seen the light much sooner. Let’s see why the first game was profitable for de Méré and why the second game was not. In a roll of a die, there are six possible outcomes: 1, 2, 3, 4, 5, 6. If the die is fair, the probability of getting a six is . Likewise, the probability of getting no six in one roll of a fair die is . Thus the probability of getting at least one six in four rolls of a fair die is 0.517747. Out of 100 games, de Méré would on average win 52 games. Out of 1000 games, he would on average win 518 games. Suppose each bet is one French franc. Then de Méré would gain 36 francs for each 1000 francs in wagered. Thus he had the house’s edge of about 3.6%. In a roll of a pair of dice, there are a total of 36 possible outcomes (i.e. the six outcomes of the first die combined with the six outcomes of the second die). Out of these 36 outcomes, only one of them is a double six. So, the probability of getting a double six is in rolling a pair of dice. Likewise, the probability of not getting a double six is . Thus the probability of getting at least one double six in 24 rolls of a pair of fair dice is 0.4914. On average, de Méré would only win about 49 games out of 100 and his opposing side would win about 51 games out of 100 games. Out of 1000 games, he would on average win 491 games (the opposing side would win on average 509 games). With each bet as one franc, the opposing side of de Méré would win 18 francs for each 1000 francs wagered (thus the opposing side having the house’s edge of about 1.8%). The odds indicated by the simulations discussed above are in line with the calculated results. It would be interesting to known what action did de Méré take after learning the answers. Maybe he stopped playing the second game and only played the first game. Maybe he modified the second game so that the odds of winning for him was at least even (or better). 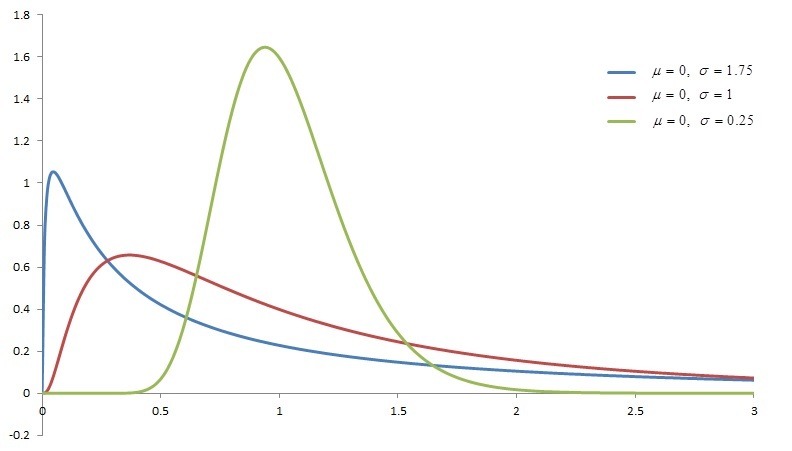 This post introduces the lognormal distribution and discusses some of its basic properties. The lognormal distribution is a transformation of the normal distribution through exponentiation. The basic properties of the lognormal distribution discussed here are derived from the normal distribution. The normal distribution is applicable in many situations but not in all situations. The normal density curve is a bell-shaped curve and is thus not appropriate in phenomena that are skewed to the right. In such situations, the lognormal distribution can be a good alternative to the normal distribution. In this post, the notation refers to the natural log function, i.e., logarithm to the base . A random variable is said to follow a lognormal distribution with parameters and if follows a normal distribution with mean and standard deviation . Many useful probability distributions are transformations of other known distributions. The above definition shows that a normal distribution is the transformation of a lognormal distribution under the natural logarithm. Start with a lognormal distribution, taking the natural log of it gives you a normal distribution. The other direction is actually more informative, i.e., a lognormal distribution is the transformation of a normal distribution by the exponential function. Start with a normal random variable , the exponentiation of it is a lognormal distribution, i.e., is a lognormal distribution. The following summarizes these two transformations. Since the exponential function gives positive values, the lognormal distribution always takes on positive real values. 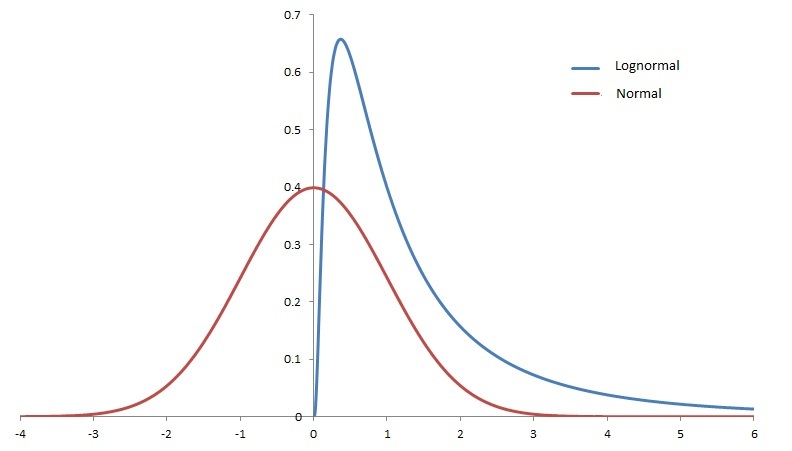 The following diagram shows the probability density functions of the standard normal distribution and the corresponding lognormal distribution. Recall that the standard normal distribution is the normal distribution with mean 0 and standard deviation 1. In Figure 1, the standard normal density curve is symmetric bell shaped curve, with mean and median located at x = 0. The standard lognormal density (it is called standard since it is derived from the standard normal distribution) is located entirely over the positive x-axis. This is because the exponential function always gives positive values regardless of the sign of the argument. The lognormal density curve in Figure 1 is not symmetric and is a uni-modal curve skewed toward the right. All the standard normal values on the negative x-axis, when exponentiated, are in the interval (0, 1). Thus in Figure 1, the lower half of the lognormal probabilities lie in the interval x = 0 to x = 1 (i.e. the median of this lognormal distribution is x = 1). The other half of the lognormal probabilities lie in the interval . Such lopsided assignment of probabilities shows that lognormal distribution is a positively skewed distribution (skewed to the right). In the above paragraph, the lower half of the normal distribution on is matched with the lognormal distribution on the interval . Such interval matching can tell us a great deal about the lognormal distribution. Another example: about 75% of the standard normal distributional values lie below x = 0.67. Thus in Figure 1, about 75% of the lognormal probabilities lie in the interval where . Another example: what is the probability that the lognormal distribution in Figure 1 lie between 1 and 3.5? Then the normal matching interval is where . The normal probability in this interval is 0.8944 – 0.5 = 0.3944. Thus randomly generated a value in the standard lognormal distribution, there is a 39.44% percent chance that it is between 1 and 3.5. The interval matching idea is very useful for computing lognormal probabilities (e.g. cumulative distribution function) and for finding lognormal percentiles. This idea is discussed further below to make it work for any lognormal distribution, not just the standard lognormal distribution. Though lognormal distribution is a skewed distribution, some are less skewed than others. The lognormal distributions with larger parameter value of tend to be more skewed. The following is a diagram of three lognormal density curves that demonstrates this point. Note that the small of 0.25 relatively resembles a bell curve. Let be a random variable that follows a lognormal distribution with parameters and . Then the related normal random variable is , which has mean and standard deviation . If we raise to , we get back the lognormal . Continuing the interval matching idea, the lognormal interval will match with the normal interval . Both intervals receive the same probability in their respective distributions. The following states this more clearly. The idea of gives the cumulative distribution of the lognormal distribution (argument ), which is evaluated as the CDF of the corresponding normal distribution at . One obvious application of is to have an easy way to find percentiles for the lognormal distribution. It is relatively easy to find the corresponding percentile of the normal distribution. Then the lognormal percentile is raised to the corresponding percentile of the normal distribution. For example, the median of the normal distribution is at the mean . Then the median of the lognormal distribution is . A quick example to demonstrate how this works. what is the probability ? what is the 95th percentile of this lognormal distribution? The z-score for the 95th percentile for the standard normal distribution is z = 1.645. Then the 95th percentile for the normal distribution with mean 2.5 and standard deviation 1.5 is x = 2.5 + 1.645 (1.5) = 4.9675. Then apply the exponential function to obtain , which is the desired lognormal 95th percentile. The above discussion shows that the explicit form of the lognormal density curve is not needed in computing lognormal probabilities and percentiles. For the sake of completeness, the following shows the probability density functions of both the normal distribution and the lognormal distribution. Of course, we do not have to use since the lognormal CDF can be obtained based on the corresponding normal CDF. One application of the lognormal PDF in is to use it to find the mode (by taking its derivative and finding the critical value). The mode of the lognormal distribution with parameters and is . To find the mean and higher moments of the lognormal distribution, we once again rely on basic information about normal distribution. For any random variable (normal or otherwise), its moment generating function is defined by . The following is the moment generating function of the normal distribution with mean and standard deviation . As before, let be a random variable that follows a lognormal distribution with parameters and . Then where is normal with mean and standard deviation . Then is simply the normal moment generating function evaluated at 1. In fact, the kth moment of , , is simply the normal mgf evaluated at . Because the mgf of the normal distribution is defined at any real number, all moments for the lognormal distribution exist. The following gives the moments explicitly. The formulas and give the variance and standard deviation if the parameters and are known. They do not need to be committed to memory, since they can always be generated from knowing the moments in . As indicated before, the lognormal median is , which is always less than the mean, which is raised to . So the mean is greater than the median by a factor of raised to . The mean being greater than the median is another sign that the lognormal distribution is skewed right. Suppose follows a lognormal distribution with mean 12.18 and variance 255.02. Determine the probability that is greater than its mean. From the last equation, we can solve for . The following shows the derivation. For any random variable , a linear transformation of is the random variable where and are real constants. It is well known that if follows a normal distribution, any linear transformation of also follows a normal distribution. Does this apply to lognormal distribution? A linear transformation of a lognormal distribution may not have distributional values over the entire positive x-axis. For example, if is lognormal, then is technically not lognormal since the values of lie in and not . Instead, we focus on the transformations where is a constant. We have the following fact. If has a lognormal distribution with parameters and , then has a lognormal distribution with parameters and . The effect of the constant adjustment of the lognormal distribution is on the parameter, which is adjusted by adding the natural log of the constant . Note that the adjustment on is addition and not multiplication. The parameter is unchanged. One application of the transformation is that of inflation. For example, suppose represents claim amounts in a given calendar year arising from a group of insurance policies. If the insurance company expects that the claims amounts in the next year will increase by 10%, then is the random variable that models next year’s claim amounts. If is assumed to be lognormal, then the effect of the 10% inflation is on the parameter as indicated above. To see why the inflation on works as described, let’s look at the cumulative distribution function of . Taking derivative of the last item above, we obtain the probability density function . Comparing with the density function , the last line is the lognormal density function with parameters and . As the formula shows, all moments exist for the lognormal distribution. As a result, any distributional quantity that is defined using moments can be described explicitly in terms of the parameters and . We highlight three such distributional quantities: coefficient of variation, coefficient of skewness and kurtosis. The following shows their definitions. The calculation is done by plugging in the moments obtained from . The above definitions are made for any random variable . The notations and are the mean and standard deviation of , respectively. Coefficient of variation is the ratio the standard deviation to the mean. It is a standardized measure of dispersion of a probability distribution or frequency distribution. The coefficient of skewness is defined as the ratio of the third central moment about the mean to the cube of the standard deviation. The second line in the above definition is an equivalent form that is in terms of the mean, variance and the third raw moment, which may be easier to calculate in some circumstances. Kurtosis is defined to be the ratio of the fourth central moment about the mean to the square of the second central moment about the mean. The second line in the definition gives an equivalent form that is in terms of the mean, variance and the third and fourth raw moments. The above general definitions of CV, and can be obtained for the lognormal distribution. The mean and variance and higher raw moments can be obtained by using . Then it is a matter of plugging in the relevant items into the above definitions. The following example shows how this is done. Determine the CV, and of the lognormal distribution in Example 2. The calculation in Example 2 shows that the lognormal parameters are and . Now use formula to get the ingredients. Right away, CV = . The following shows the calculation for skewness and kurtosis. Is there a moment generating function for the lognormal distribution? Because the normal distribution has a moment generating function, all moments exist for the lognormal distribution (see formula above). Does the moment generating function exist for the lognormal distribution? Whenever the mgf exists for a distribution, its moments can be derived from the mgf. What about the converse? That is, when all moments exist for a given distribution, does it mean that its moment generating function would always exist? The answer is no. It turns out that the lognormal distribution is a counterexample. We conclude this post by showing this fact. Let be the standard lognormal distribution, i.e., has the standard normal distribution. We show that the expectation converges to infinity when . The last integral in the above derivation converges to infinity. Note that the Taylor’s series expansion of is . In the last step, is replaced by . Then the exponent in the last integral is a third degree polynomial with a positive coefficient for the term. Thus this third degree polynomial converges to infinity as x goes to infinity. With the last integral goes to infinity, the mgf goes to infinity as well. Practice problems to reinforce the calculation are found in the companion blog to this blog.